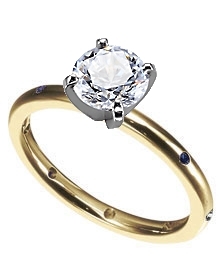 This is a wonderful 2.5 mm engagement ring with small side stones. The ring is designed with three flush-set G-H color, VS clarity diamonds and four 1.75 mm blue sapphires. This ring is considered an eternity style ring and is unable to be resized or returned.